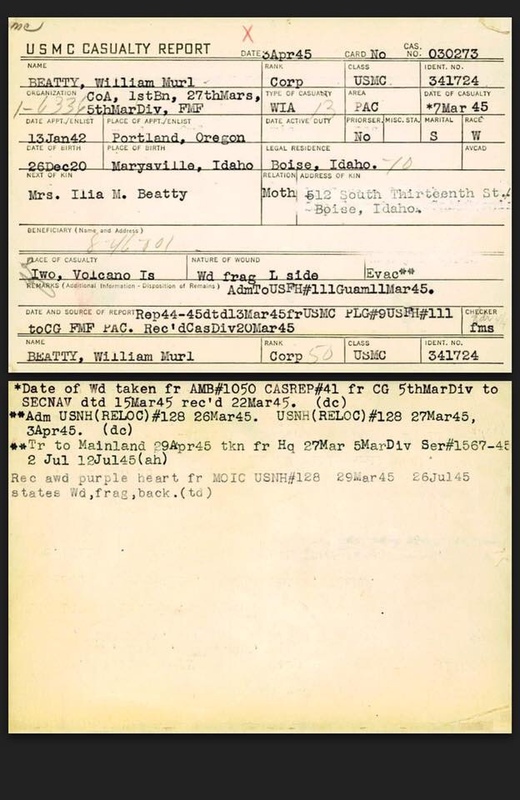 William Murl Beatty enlisted in the United States Marine Corps on January, 13th, 1942 in Marysville, Idaho. 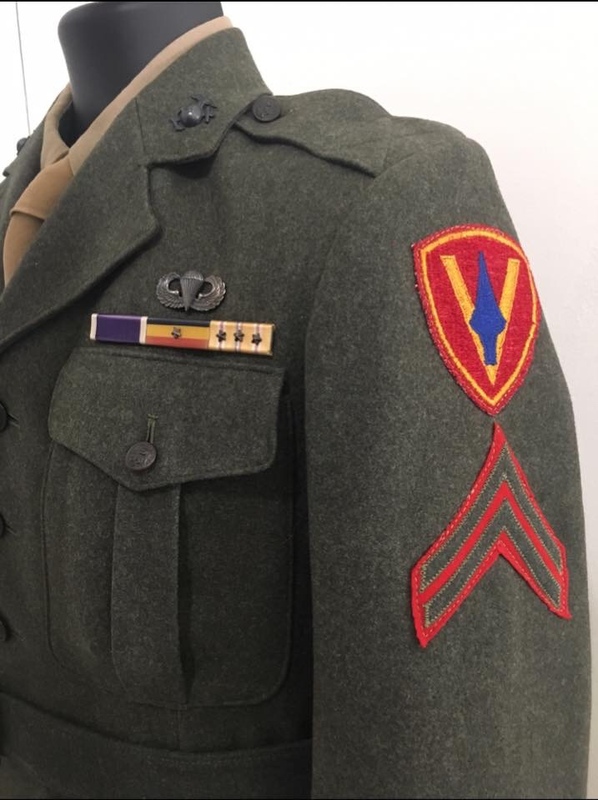 William Beatty would join Company D, 22nd Marines on June 11th, 1942 and continue to train with them until July, 14th of the same year when he would enter Para training school. With the MOS of infantry assault demolitions as his primary MOS and rifleman as his second, Private First Class Beatty would enter the field with the 2nd Parachute Battalion. From October, 27 to November 5th of 1943 Beatty and the 2nd Marine Parachute Battalion would participate in the Choiseul Island Raid. The purpose of the raid was to convince the Japanese that this was the main Amphibious assault and divert forces away from the landing at Empress Augusta Bay. Although it may not have worked as a diversion, the operation was highly successful as a raid. The Marines took 24 casualties of which 9 were killed, while the Japanese lost 143 dead, two barges, 180 tons of supplies and a sizable amount of fuel. PFC Beatty and the rest of his battalion would join in the fight on Bougainville after their raid. 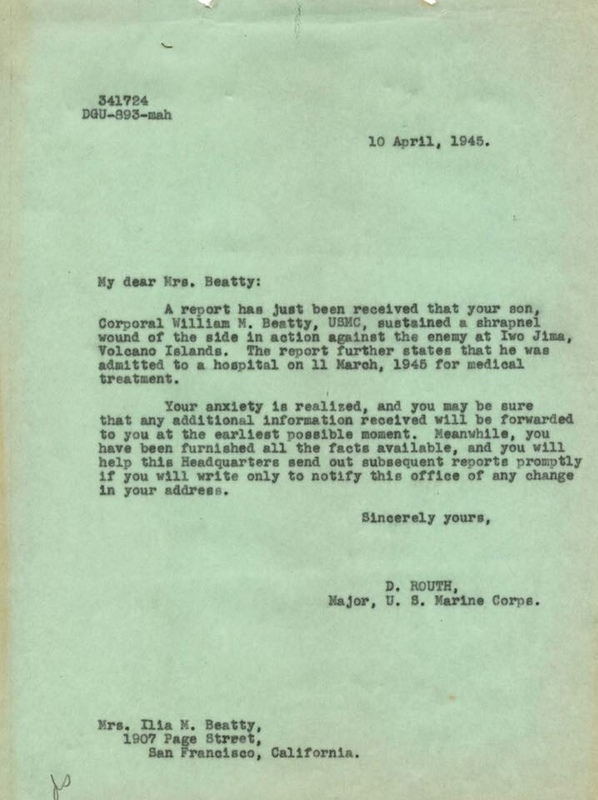 On February 4th, 1944 Beatty returned to San Diego as the Paramarines were dissolved. 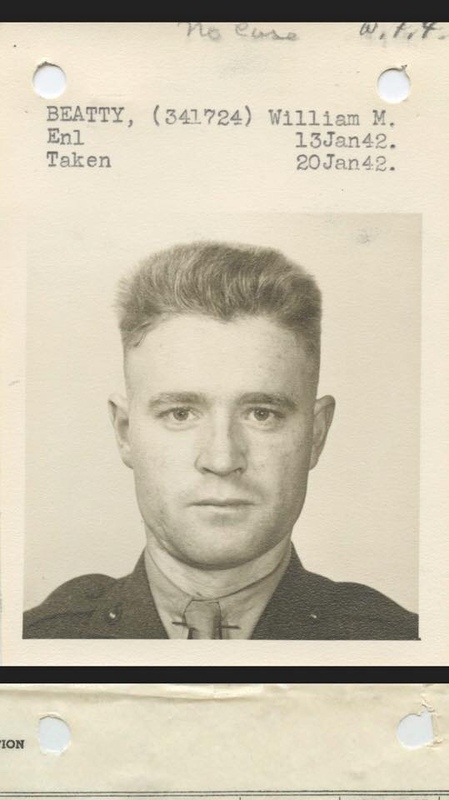 In March of 1944 William would join Co A, 1st Bn, 27th Marines, 5th Marine Division and began training with Engineers. He would still have the designation of an infantry assault demolitions specialist. On the 19th of February, 1945, with his new rank of Corporal, William Beatty would land on Iwo Jima’s beaches in an area designated as Red Beach 2. He would fight on with Co. A until March 7th by wound fragments to the left side of his body. He would return to his unit in late April as a rifle NCO and receive an honorable discharge in 1946. 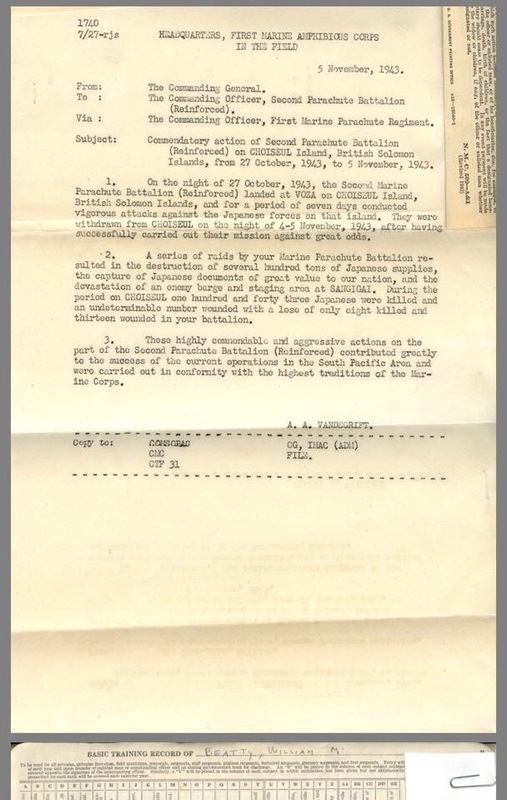 1 Navy unit commendation for the Choiseul Island Raid. I didn’t but I’d be very interested in giving it a read! Did you post the grouping here recently? It's been a few years since I posted it so I'll probably need to repost. 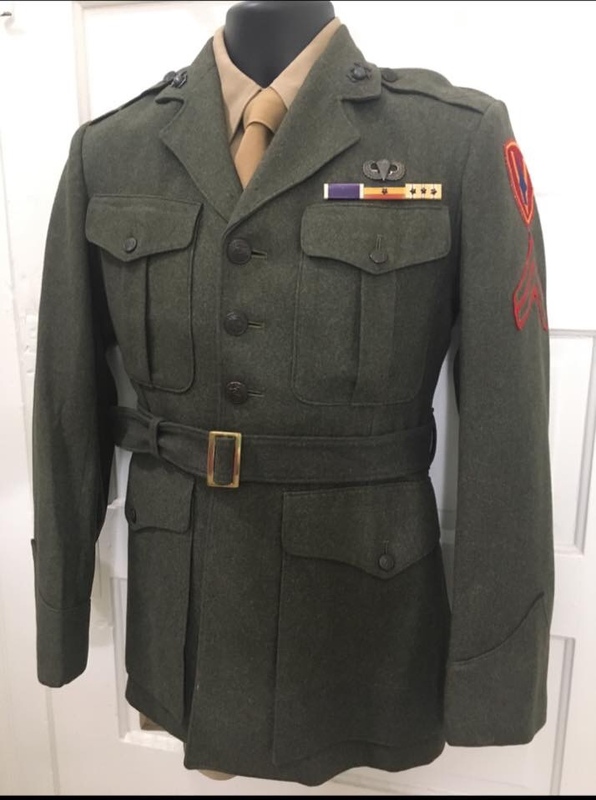 How many USMC para jackets do you have? I'd kill for that! Beauty! Seriously, very interested in Choiseul raid - yeah, read MISSION RAISE HELL - great book and great story!! MES, love to see your grouping! Thank you and I’m going to give it a read! Thank nick! I’d love to see them! There is more out there. Just give it time to someone esle list,s one. I have never owned one of those groups myself. Thank you so much for posting! Sounds like you are as obsessed with the Choiseul raid as I am! Little known event but a fascinating story and a really ferocious battle.